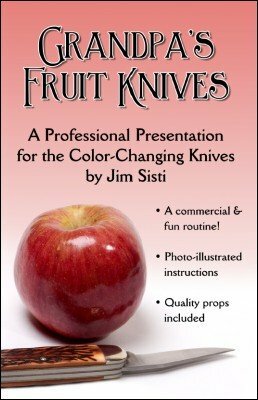 This manuscript is the result of my explorations into the Color-Changing Knives. I always loved the trick but could never find a presentation to really make it mine. I imagined the spectators asking themselves, "Why is he carrying knives?" "Why are they changing color?" and most importantly, "Why should I care?" Early in my restaurant career, I tried the opening gambit usually attributed to Ron Wilson: "Excuse me, did you lose a white pocket knife? No? How about a black one?" I always half-expected someone to answer "yes" to my first question, take the knife out of my hand, put it in their pocket, and then turn back to their dinner companions. I filed the trick away and consigned it to the list of effects that I enjoyed doing but would probably never use professionally. We now flash forward about ten years as I found myself performing at a family picnic. It was a big, loud, loveable Italian family and, being of the same heritage, I immediately felt a kinship with them. As people tend to do at family get-togethers, they were seated according to age. As I approached the table where the older gentlemen were gathered, I saw that they were all silently engaged in peeling fruit with small penknives. I instantly flashed back to mental snapshots of my grandfather doing exactly the same thing. I recalled that the older Italian men in the neighborhood I grew up in almost always carried a small knife around to peel a piece of fruit or cut off a hunk of table cheese. Something clicked and I went home, dug out my Color-Changing Knives, and got to work. The inspiration for the resulting routine's structure belongs completely to Michael Skinner. I looked at dozens of routines and for my purposes – largely strolling situations – his was the best for getting in and out of the routine neatly and cleanly. I fitted my script to the actions and the result is what you're now holding in your hands – a routine that's been on my A-list for more than a decade. 1st edition 2011, 12 pages, photo illustrated.